Anna van Leer, born at Drachten on 1 March 1886, married Mozes Abraham Roos, born at Nieuwleusen on 28 November 1884. They had nine children, of whom Mozes and Jacob came to live in Meppel. Jacob died before WWII on 29 January 1939 at the age of 57, when traveling to Warnsveld. Mozes was a butcher, like his brother-in-law. He worked at the export slaughterhouse of Van der Sluis and even lived next door at 54 Ezingerweg. The couple had three sons. Hein Mozes, born on 11 April 1924, called Broertje ‘little brother’ by the family, was the youngest. He worked as a shop assistant in the grocery of Mr. Spijkerman on Gasgracht opposite Kuperusvonder. Leman had a totally different profession, he was a coppersmith. After finishing technical school he was employed by the firm of Rijkeboer, a plumber in Kruisstraat. Leman Roos lived on Ezingerweg. Leo Roos worked for my father as a plumber. I often went with him to do jobs in or outside Meppel. I still remember that we kept him employed, although this was no longer allowed. Jews were no longer allowed to work for non-Jewish firms. The last months that he worked for us he had the Star of David pinned on his overalls. When he worked outside Meppel, he took it off. Nobody knew him there. In his spare time Leman was an enthusiastic football player and a member of MSC. On 22 October 1941 there came an end to this. As a Jew he was no longer allowed to play for this club. There is still a receipt, dated 7 June 1941 of the treasurer of MSC which says that Leman had paid his contribution (60 cents) for 10 May till 7 June 1941. This must have been one of his last payments to his beloved club. He was also a member of Gemiloeth Chasadiem, a Jewish burial society. He could not have suspected that his own funeral would be under totally different circumstances. Bram and Mietje went to live at 54 Papaverstraat. They were very proud of their relatively new house. Their cousin Taapke came especially from Drachten to help the young couple to clean their new home. Bram Roos and his fiancée Mimi Blok on a tandem in front of the export slaughterhouse of Van der Sluis where both Mozes and Bram worked. Mimi lived, before she came to Meppel at 9 Lindenweg in Oss. That mutation had not been passed on either, apparently. The next day the town clerk Mr. De Carpentier corrected this ‘mistake’. First Moos gone, nearly four weeks ago now, and the boys left 2 weeks ago. M. is at Orvelte and Hein, L and B. first went to Linde in the district of Zuidwolde, just for one day and they had to get up at 2 o’clock and at 3 o’clock they had to walk to Hoogeveen carrying their luggage. B. had very sore feet. They went by train to Hooghalen and from there they had to walk 9 kilometers to Westerbork […] They stayed there till Sunday night. Broer (Hein) had to go on transport to Germany first. Leo wanted to go with him and he had to go too. I was so pleased about this and so was M.. Perhaps they are still together. Bram is still at Westerbork, but he will probably have to leave too. Mimi will then go with him, she says, so I will be here all alone .Maybe we will have to go too. I usually stay with Mimi. She prefers that, and I do not like being alone, it’s all very hard. […]you can imagine what a terrible situation we are in, but we have to be brave and we hope and trust that with God’s help everything will be all right again one day. That is all we can do for all of them. Aron and Eli van Gelder have also gone to Germany. Leo is still at Westerbork. He is married now. And Sallie van der Sluis is also gone. Nearly everybody has gone, it is all so dreadful. What kind of world do we live in? Bram does not earn a penny. M. earns about 6 guilders a week. So brave of him, we can just get by on it. We will be able to manage if he can stay there. We will send a parcel. It is not allowed but we will do this illegally. Food is pretty bad over there. 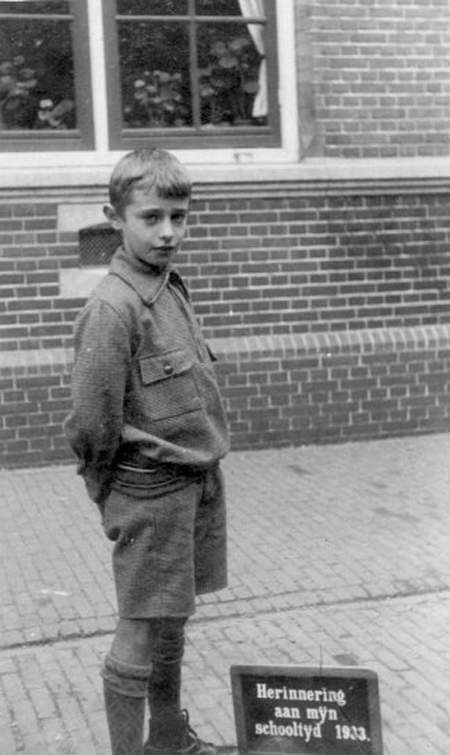 Hein Roos posing for the school photographer in front of Vledder School (1933). Leman and Hein have never seen their family back. Already on 24 August they were deported from Westerbork to Auschwitz (as ‘volunteers’), as we can read in their mother’s letter. Leman died on 18 September (possibly by pneumonia) and Hein on 30 September. 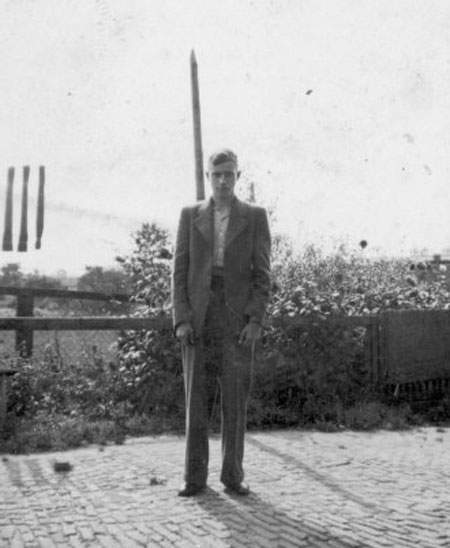 Abraham was allowed to stay in Westerbork, probably because he was married. On 3 October he must have given his father, mother and Mimi a hearty welcome. The fact that the two boys had been carried off to the East undoubtedly cast a shadow over their reunion. The next to depart were Anna and Mozes. They seem to have had plans to go into hiding, but they were too late. The Police had already taken them from their home. They went to Auschwitz on 30 October and died there on 2 November (as usual exactly three days later). At last I will write you a card to inform you that we are all right. Mimi has just gone to work and I have finished my job for today till tomorrow morning 7 o’clock. I hope you are all well. Will you write back? We are allowed to receive parcels. Is uncle Moos able to earn a living? How are Leo’s children? Mimi did not feel well a couple of days ago but fortunately she is o.k. now. Last Sunday, the 28th was my birthday. Leo [Leman] van Gelder and Martha [(his wife Martha van Zuiden, TR] are still here, fortunately. It is a large camp here with at least 100 barracks, big ones and small ones. The big ones house more than 400 people, all bunk beds, three on top of each other and right next to each other. Each barrack is split up in two halves, one side for the men, the other for the women. As long as I have been here I have slept next to Leo van Gelder, but last week Mimi and I had to move to a smaller barrack. We are now in a big one again. The food is not very good here. Leo and I are lucky because we work in the kitchen and often prepare a snack for ourselves. The main problem is the shortage of butter. Well, you will understand that we lack a lot. No meat etc., too much to mention. We usually have mashed potatoes and cabbage (red, white or sauerkraut). Sometimes groats or soup and often potatoes boiled in their skins. But enough about this. brother) went right at the start in August. Awful isn’t it? We try not to think about it but we have our bad moments as you can imagine. There are at least 10.000 people here at the moment. Three times a week a large and many small transports come in from the provinces. Every Tuesday people leave, 1200 this morning, 2000 last week, many old and sick people among them. It is so sad to see this and we have seen this from August onward. We are lucky that we are still here and we hope to remain here for a while. I wish the times would change. Life is very hard here, but we adapt ourselves to the circumstances. We are very glad that we can stay here for the time being, we really hope so. What it is like here, I really cannot describe, just miserable. But we are young and we have our work, so we manage. Write us back, please, but when you do this be careful in what you say, because some letters are opened. Do not enclose letters in parcels, please. Bram is in bed, because he bruised he knee when playing football last Saturday. Maybe he has to go to hospital, for it hurts very much. Was this letter their last sign of life? At any rate Mimi and Bram were on the transportation list of 18 May 1943. Their short marriage ended in the gas chambers of Sobibor three days later on 21 May 1943. 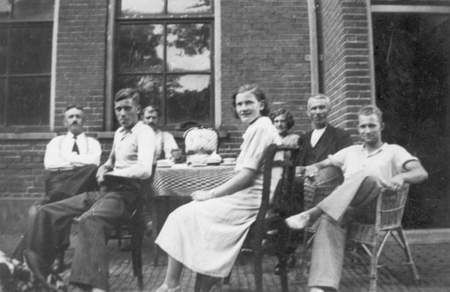 A remarkable detail is that only Mietje’s mother Hester Blok-Odewald has survived the war. The Roos family next to their house on Ezingerweg. Abraham Roos and Mimi Blok lived in one of these houses.